Moscow State University (MSU; Russian: Московский государственный университет имени М. В. Ломоносова, often abbreviated МГУ) is a coeducational and public research university located in Moscow, Russia. It was founded on 23 January [O.S. 12 January] 1755 by Mikhail Lomonosov. MSU was renamed after Lomonosov in 1940 and was then known as Lomonosov University. It also houses the tallest educational building in the world. Its current rector is Viktor Sadovnichiy. According to the 2018 QS World University Rankings, it is the highest-ranking Russian educational institution and is widely considered the most prestigious university in the former Soviet Union. Saint Petersburg State University and Moscow State University engage in friendly rivalry over the title of Russia's oldest university. Though Moscow State University was founded in 1755, its competitor in St. Petersburg has had a continuous existence as a "university" since 1819 and sees itself as the successor of an academy established on 24 January 1724, by a decree of Peter the Great. In 1804, medical education split into clinical (therapy), surgical, and obstetrics faculties. During 1884–1897, the Department of Medicine—supported by private donations, and the municipal and imperial governments—built an extensive, 1.6-kilometer-long, state-of-the-art medical campus in Devichye Pole, between the Garden Ring and Novodevichy Convent; this had been designed by Konstantin Bykovsky, with university doctors like Nikolay Sklifosovskiy and Fyodor Erismann acting as consultants. The campus, and medical education in general, were separated from the Moscow University in 1930. Devichye Pole was operated by the independent I.M. Sechenov First Moscow State Medical University and by various other state and private institutions. On 6 September 1997, the French electronic musician Jean Michel Jarre, whom the mayor of Moscow had specially invited to perform, used the entire front facade of the University as the backdrop for a concert: the frontage served as a giant projection screen, with fireworks, lasers, and searchlights all launched from various points around the building. 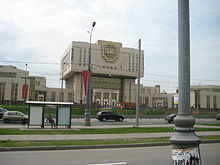 The stage stood directly in front of the building, and the concert, entitled "The Road To The 21st Century" in Russia but renamed "Oxygen In Moscow" for worldwide release in video/DVD, attracted a world-record crowd of 3.5 million people. On 19 March 2008, Russia's most powerful supercomputer to date, the SKIF MSU (Russian: СКИФ МГУ; skif means "Scythian" in Russian) was launched at the University. Its peak performance of 60 TFLOPS (LINPACK - 47.170 TFLOPS) makes it the fastest supercomputer in the Commonwealth of Independent States. 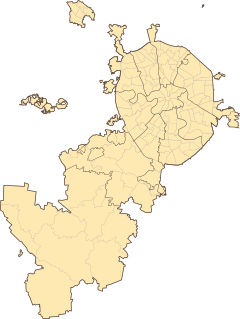 Since 1953, most of the faculties have been situated on Sparrow Hills, in the southwest of Moscow, 5 km from the city centre. The main building was designed by architect Lev Vladimirovich Rudnev. In the post-war era, Joseph Stalin ordered seven huge tiered neoclassic towers to be built around the city. It was built using Gulag labour, as were many of Stalin's Great Construction Projects in Russia. Located on Moscow's outskirts at the time of its construction, the location of the main building is now about half-way between the center of Moscow at the Kremlin and the city's current limits. The Journalism Department now occupies the university's original location in downtown Moscow across from the Manezh, steps from the Kremlin and other government buildings. Indeed, frequent student unrest, including street protests, well pre-dating 1917 may be one reason why Stalin's planners sited the university across the Moscow River, so far away. The MSU main building was the tallest building in the world outside of New York City at the time of its construction, and remained the tallest building in Europe until 1990. The central tower is 240 m tall, 36 stories high, and flanked by four huge wings of student and faculty accommodations. It is said to contain a total of 33 kilometres of corridors and 5,000 rooms. The historical building on Mokhovaya Street now mainly houses the Faculty of Journalism, the Faculty of Psychology, and The Institute of Asian and African Studies. The university includes a number of faculty buildings located near Manege Square in the centre of Moscow and a number of campuses abroad in Ukraine, Kazakhstan, Tajikistan and Uzbekistan. 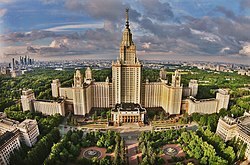 Moscow State University is one of Russia's most prestigious institutions of higher learning, and has demanding entry requirements for prospective students. Nonetheless, it performs inconsistently in international rankings. While it was placed 77th overall by the Academic Ranking of World Universities and 112th by QS World University Rankings, it was not included among the top 200 universities by recent Times Higher World University Rankings and came in at 296th (based on the full THE World University Rankings in their iPhone application). On a highly cited and consistent ranking, Moscow State University ranked 43rd in 2008, 44th in 2009–2011, and 45th among 300 Best World Universities in 2012 compiled by Human Resources & Labor Review (HRLR) on Measurements of World's Top 300 Universities Graduates' Performance. Despite its large number of faculties, Moscow State University seems to be strong mostly in natural sciences and mathematics (currently placed between 38th and 75th in the world) but considerably weaker in other disciplines. Despite the fact that it is still the highest ranked Russian university according to the three international rankings mentioned above (with the nearest Russian competitor being Saint Petersburg State University that scored 300–400th), the university was consistently placed outside top 5 nationally in 2010–2011 by Forbes and Ria Novosti / HSE, with both ratings based on data set collected by HSE from Russian Unified State Exam scores averaged per all students and faculties of university. A few more narrowly specialized Moscow colleges, including the Moscow Institute of Physics and Technology and the Moscow State Institute of International Relations were split off from MSU at one time or another and have since established strong reputations of their own. As of 2017, 13 Nobel laureates, 6 Fields Medal winners and 1 Turing Award winner have been affiliated with the university. It is the alma mater of many famous writers such as Anton Chekhov and Ivan Turgenev, politicians such as Mikhail Gorbachev and Mikhail Suslov, as well as renowned mathematicians and physicists such as Boris Demidovich, Vladimir Arnold, and Andrey Kolmogorov. ^ Blinnikov, Mikhail S. (13 June 2011). Geography of Russia and Its Neighbors. Guilford Press. p. 223. ISBN 9781606239216. Retrieved 2015-02-15. ^ "8th edition of the Top 50 list of the most powerful computers in Russia released". Top500.org. TOP500 Supercomputing Sites. 2008-04-16. Archived from the original on 2011-09-27. Retrieved 2011-10-29. ^ "ru:В МГУ запустили мощнейший в СНГ компьютер". Km.ru. 2008-03-20. Retrieved 2016-07-14. ^ Figes, O. (2013) 'Just Send Me Word – A True Story of Love and Survival in the Gulag' pg. 192, Penguin Books: London. ^ Academic Ranking of World Universities – 2011| Top 500 universities | Shanghai Ranking – 2011 | World University Ranking – 2011. Shanghai Ranking. Retrieved on 2011-10-29. ^ a b "QS World University Rankings 2011 Results". Archived from the original on 2011-10-02. ^ a b Top 200 – The Times Higher Education World University Rankings 2010–2011. Timeshighereducation.co.uk. Retrieved on 2011-10-29. ^ "Moscow State University". Archived from the original on 2011-11-18. Retrieved 2011-09-16. ^ a b Самые сильные университеты России. Таблица. Forbes.ru. (2010) Retrieved on 2011-10-29. ^ a b c Рейтинг качества приема в российские государственные вузы–2010 | Все рейтинги | Лента новостей "РИА Новости". RIA Novosti (2011-02-28). Retrieved on 2011-10-29. ^ Сводный рейтинг выборки университетов России. Retrieved on 2012-04-02. ^ a b c Moscow State University. Shanghairanking.com. ^ Lomonosov Moscow State University Archived October 2, 2011, at the Wayback Machine,Lomonosov Moscow State University. Topuniversities. Retrieved on 2011-10-29.